Are you stuck in a cycle of unproductivity? For one reason or another, do you lack enough time today to invest in tomorrow? It's difficult to think about breaking the cycle when you have an overwhelming amount of work to do, and you simply can't find enough time to find a solution. 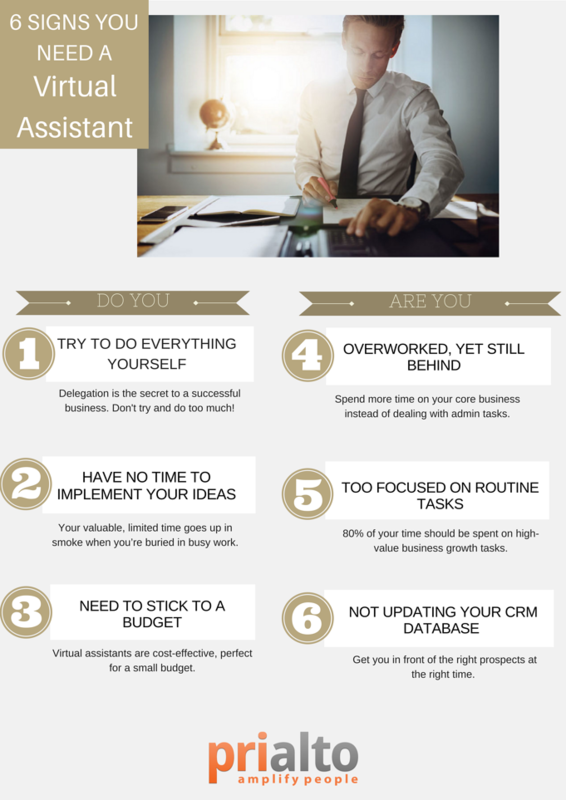 Should you hire a virtual assistant to help you gain back more of your time as well as grow your business? Here Are 6 Red Flags That Point to "Yes!" I Got This: Typically, you find yourself at a stalemate with yourself and your business’s forward progress. More Admin Than Agile: 80% of your time should be spent on high-value business growth tasks. Ain't No Rest for the...Executive: Spend more time on your core business instead of dealing with admin tasks and putting out fires all week long. Big Ideas Never See the Light of Day: Don’t put off projects that could dramatically impact your business because you’re overwhelmed by administrative tasks. No New Revenue: A virtual executive assistant can help you pull your business forward by consistently getting you in front of the right prospects at the right time. Small Budget With Huge Ambitions: Hiring a virtual executive assistant beats hiring an in-house administrative assistant when you’re on a small budget, because it’s cost-effective. Learn more about what a virtual executive assistant can do for you. See also "Want to Hire a Virtual Assistant? 5 Common Objections Answered."